The conference is using https://sched.org to help participants organise themselves and decide which sessions they want to attend. I have just spent a bit of time exploring this and it is very easy to use, which is helpful. I have already decided my schedule. I have also spent some time today, looking at the presentation that Jutta and I will be giving. Jutta will arrive here from Graz, Austria on the Thursday before the conference. We will spend the Friday working on finalising this presentation, and also catching up on other projects and then over the weekend, if it is fine, we will be walking in the Lakes and maybe cycling. I hope Jutta will like the Lake District, but I suspect she will think it a mini version of Austria :-). We will hopefully have plenty of time to talk, which there never seems to be enough time for at conferences, but maybe this conference will be different. Our presentation relates to on-going research into emergent learning and the use of the Footprints of Emergence Framework developed collaboratively with Roy Williams and Simon Gumtau in 2011/12 (see references below). This is a drawing tool for reflecting on learning experiences in any learning environment, but particularly complex open learning environments such as MOOCs. It can be used by learners, teachers, designers or researchers. The results are always interesting and often surprising. Over the years we have collected examples on an open wiki – https://footprints-of-emergence.wikispaces.com/ . The Networked Learning Conference papers are limited to 8 pages, so we put the footprint drawings related to this presentation on the wiki here. This is not the first time that Jutta and I have worked together. We met in the Change11 MOOC run by Stephen Downes and George Siemens and then again in a course run by Etienne and Beverly Wenger-Trayner in which we were both online participants. Bev has just posted a video about this year’s courses. And then in 2014 Jutta invited Roy Williams and me to be the keynote speakers at her e-learning conference in Graz, where she and I met in person for the first time. It was a very enjoyable experience and the preparation for it meant that Roy and I thought through our research into emergent learning even further. Jutta published our paper and I blogged about the presentation here. 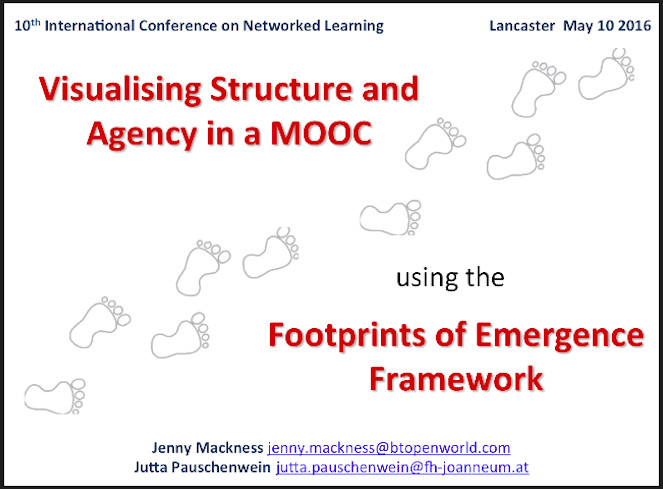 Jutta has been enthusiastic about the Footprints of Emergence Framework from the start and uses the footprints a lot, both personally and with her students. In our presentation for the networked learning conference we will explain how she used them with participants and teachers in the Competences for Global Collaboration MOOC, which she has now run twice and how this has informed our thinking about the balance between structure and agency in open, online learning environments. We welcome questions either here or at the conference and are both looking forward to discussions and the whole event. Previous Article Grids & Gestures Exercise. The text behind my experience. Can’t wait to see you (and hear more about your study) at #NLC2016!